The Purple Xperience comes to the SFA campus on Friday, Nov. 30, as an Encore Event. The performance is sponsored by Lehmann Eye Center. NACOGDOCHES, Texas - Finding that special gift for the person who has everything may not be as difficult as you think, especially if that certain someone likes live music. The Stephen F. Austin State University College of Fine Arts and its University Series will present two concerts prior to Christmas, and purchasing tickets as gifts is as easy as going online to finearts.sfasu.edu or picking up the phone to call the Fine Arts Box Office. The options are as varied as a full-on rock concert to a bluegrass holiday show. But you need to act quickly, because tickets to The Purple Xperience, the most authentic Prince tribute in the world, on Nov. 30 and award-winning bluegrass sensations Dailey & Vincent on Dec. 11 are going fast, according to Scott Shattuck, associate dean of the College of Fine Arts and director of the University Series. "Fans of musical variety will want to see both of these knockout concerts," Shattuck said, "but many people will instantly know that one or the other is just right for them. What the two evenings have in common is incredibly high quality. These are all nationally known, world-class musicians who have played and recorded with the top superstars." A presentation of the College of Fine Arts and sponsored by Lehmann Eye Center, The Purple Xperience is a five-piece group that transports the spirit and sound of Prince direct from Minneapolis. Front man Marshall Charloff, who once recorded with Prince, channels the vocals and moves of the critically acclaimed icon in an unmatched, uncanny fashion, from his appearance to his multi-instrumental capacity, Shattuck said. 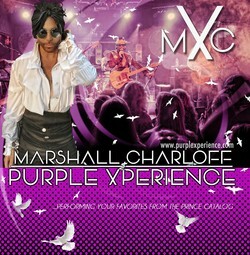 The Purple Xperience is presented as a special Encore Event, and tickets are $45 for Section A seating; $36 for Section B seating; and $27 for Section C seating. Discounts are available for seniors, students, children and SFA faculty and staff members. A little closer to Christmas, Dailey & Vincent will present "A Springer Mountain Farms Christmas," featuring holiday favorites performed as only this bluegrass duo can. Known from their Saturday night show on RFD-TV, Jamie Dailey and Darrin Vincent have won 13 International Bluegrass Association Awards, including three for Entertainer of the Year, three for Vocal Group of the Year, two for Album of the Year and one for Male Vocalist of the Year (Jamie). Individually, they have performed or recorded with Dolly Parton, Emmylou Harris, Earl Scruggs, Vince Gill, Bruce Hornsby, the Gaither Vocal Band and others. Dailey and Vincent have been nominated for two Grammy Awards and won a Dove Award for Bluegrass Album of the year. Commercial Bank of Texas sponsors the University Series performance. University Series and Encore Event performances are at 7:30 p.m. in W.M. Turner Auditorium in the Griffith Fine Arts Building on the SFA campus. Dailey & Vincent will present "A Springer Mountain Farms Christmas" on Tuesday, Dec. 11, in Turner Auditorium on the SFA campus. The performance is sponsored by Commercial Bank of Texas.